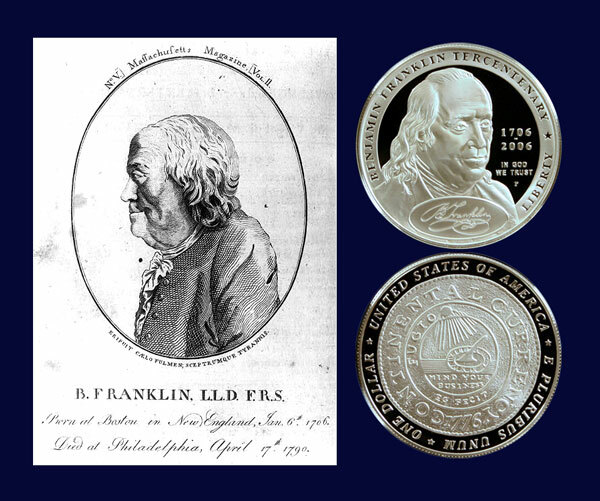 Today, the Benjamin Franklin Founding Father Commemorative Silver Dollar remembers one of the last helpful actions performed by Mr. Franklin 225 years ago. Encroachments being made on the Eastern Limits of the United States by Settlers under the British Government, pretending that it is the Western, and not the Eastern River of the Bay of Passamaquoddy, which was designated by the Name of St. Croix in the Treaty of Peace with that Nation, I have to beg the Favor of you to communicate any Facts which your Memory or Papers may enable you to recollect, and which may indicate the true River the Commissioners on both sides had in their View, to establish as the Boundary between the two Nations. It will be of some Consequence to be informed by what Map they traced the Boundary. I received your Letter of the 31st past, relating to Encroachments made on the Eastern Limits of the United-States, by Settlers under the British Government, pretending that it is the Western and not the Eastern River of the Bay of Passamaquoddy, which was designated by the Name of St. Croix in the Treaty of Peace with that Nation; and requesting of me to communicate any Facts, which my Memory or Papers may enable me to recollect, and which may indicate the true River the Commissioners on both Sides had in their View, to establish as the Boundary between the two Nations. —Your Letter found me under a severe Fit of my Malady, which prevented my answering it sooner, or attending indeed to any kind of Business. —I now can assure you that I am perfectly clear in the Remembrance that the Map we used in tracing the Boundary was brought to the Treaty by the Commissioners from England, and that it was the same that was published by Mitchell above 20 Years before. Having a Copy of that Map by me in loose Sheets I send you that Sheet which contains the Bay of Passamaquoddy, where you will see that Part of the Boundary traced. —I remember too that in that Part of the Boundary, we relied much on the Opinion of Mr. Adams, who had been concerned in some former Disputes concerning those Territories. I think therefore that you may obtain still farther Lights from him. That the Map we used was Mitchel’s Map, Congress were acquainted, at the Time, by a Letter to their Secretary for foreign Affairs, which I suppose may be found upon their Files. Just over a week later, Mr. Franklin died at 84 years of age on April 17, 1790. 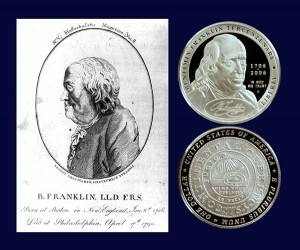 The Benjamin Franklin Founding Father Commemorative Silver Dollar shows beside an image, circa 1790, of Mr. Franklin’s death notice in a Massachusetts magazine.